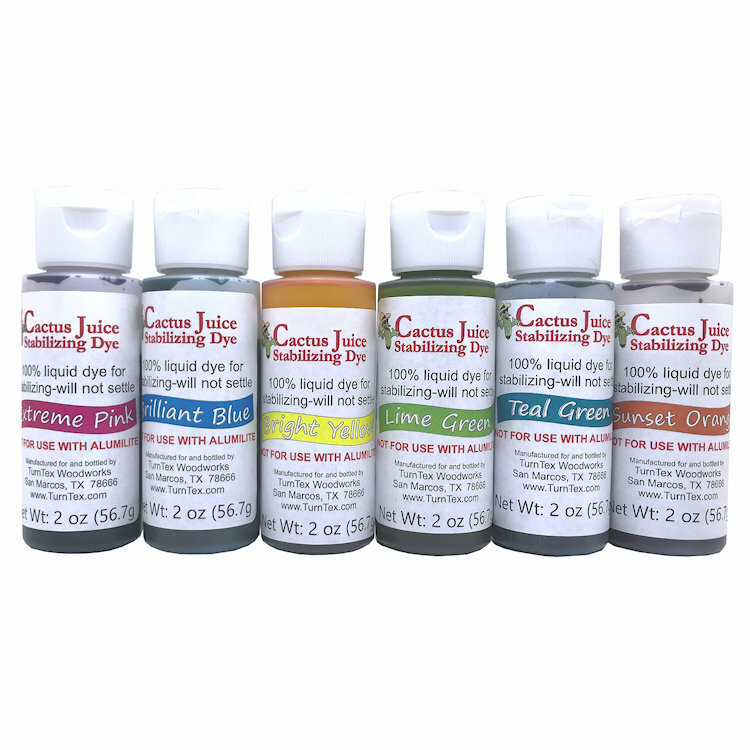 Cactus Juice Stabilizing Dyes are designed specifically for adding bright, vibrant color to your stabilizing toolbox. These 100% liquid dyes will not settle over time and will help you achieve some of the really bright colors that are just not possible to achieve with Alumilite Dyes. Cactus Juice Stabilizing Dyes are not meant to replace Alumilite Dyes but are mainly to fill in the gaps where Alumilite Dyes can fall short. Provided in bulk 8 oz (by weight) sizes with easy pour flip top cap. Cactus Juice can be dyed when you want to add some color to the material you are stabilizing. For this discussion I will assume wood but the same principles work with any porous material. The best success will be obtained with either Cactus Juice Stabilizing Dyes or Alumilite Dyes. They are both very concentrated and produce nice, vivid colors that mix and work well with Cactus Juice. Some powdered dyes can work as well but typically have a hard time dissolving thoroughly, leaving a residue in the bottom of the mixing container and on the blanks, sometimes preventing proper uptake of the resin. Cactus Juice Stabilizing Dyes and Alumilite dyes will not affect the cure of the Juice since they are specifically made for use in plastic resins. Be sure to use more dye than you think you need! I recommend starting out with a ratio of 1oz per gallon of Cactus Juice. Add the dye to the Cactus Juice in a jug and shake vigorously. Then run a sample batch wiht the wood you plan to do to completion. After cured, cut in half lengthwise to see what the color inside looks like. If it is too dark, add clear Cactus Juice to your mix. If it is not dark enough, add more dye. Just keep in mind that it takes a LOT more dye than you think to get good color in most woods.